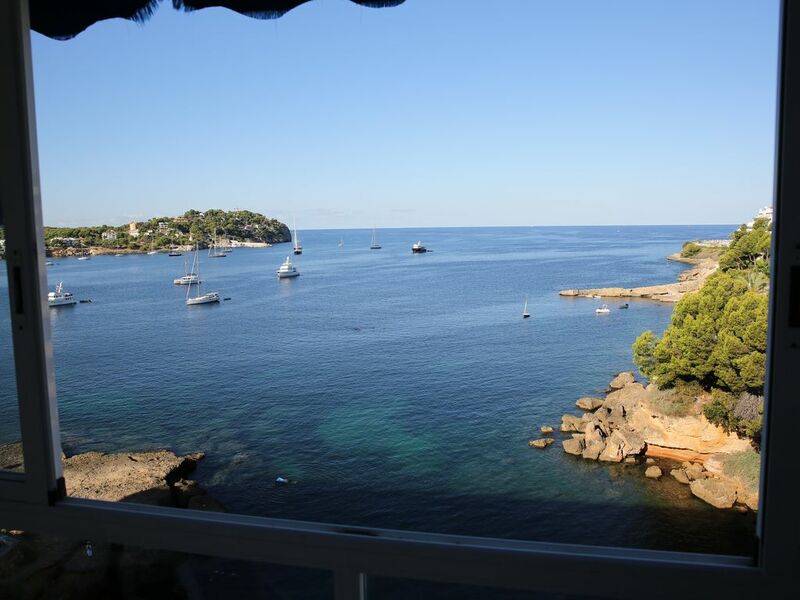 Apartment with the great sea view in best location of Santa Ponsa. A well-equipped holiday apartment for 4 people in the building located 20 meters from the sea. The elevator will take you straight to the beautiful and calm beach in a minute - you do not even need to dress up for a walk. The beach has areas with natural shades to protect you from direct sun. The main beach of Santa Ponsa is also in the walking distance. The swimming pool lovers can take advantage of the community private pool that is open for you during the whole day. The apartment is fully air-conditioned with separate units in living room and bedroom. Sufficient amount of towels and bed linens is included. The washing machine is available. The apartment is located on the 8th floor and provides you with a magnificent view on open Mediterranean sea and Santa Ponsa bay. The terrace is an ideal place for romantic dinners with the sea view. Next morning the gentle sound of sea waves will wake you up for a new beautiful day. The apartment is within walking distance to the center. Private parking place is included into the offer. Wi-Fi Internet with your own SIM card. The location is good. given the price the booking is good, however no internet and some of the benefits of the place need to be updated a little. Door lock was broken. Only a single door key. Otherwise great view and in a nice area of the town. Internet access hit and miss. But overall would highly recommend. Glad that you enjoyed your stay with us. Loved the apartment and the view, access could be improved. Overall the apartment was ideal. Great location, amazing view, easy access to the town of Santa Ponca and a private beach! The owner was very helpful and accessible via phone and email. Unfortunately, the contact he has helping give access upon your arrival was rude, unhelpful and even hung up on me as we were lost trying to find the apartment. She complained that we arrived on a Sunday which was inconvenient for her. Although this put a damper on our arrival and made it stressful for us, we still had a great stay and would recommend it. You may want to bring your own pillow- but other than that, the apartment is fully stocked and pictures don't do the view justice! I thank you very much for your review. This is the first review we have got and I'm glad that you loved the apartment and had a great time in Santa Ponsa. This is indeed a wonderful place and I'm happy I was able to help you enjoying it. Feel very sorry for the sour welcome as you could imagine was not part of my intentions. We are working on bringing better experience to our guests with better local partners. I hope to see you next time again in our apartment. Let me know in advance and I'll try to personally meet you at the gate. Die Wohnung ist NICHT rollstuhlgeeignet, ich konnte nur in die Wohnküche, aber nicht ins Bad und ins Schlafzimmer; also Schlafen auf der Couch und Waschen am Küchen-Spülbecken. Eine Lampe defekt, zwei weitere Lampen ohne Schalter. H.E.